Update: This is back in stock on Amazon! Hurry and get the Trident Layers Sugar Free Gum (Grape Lemonade, 14-Piece, 12-Pack) today for $12.67 NOW only $6.34 from Amazon Warehouse Deals! That’s just $.53 per pack! Be quick since this is a limited time Warehouse Deal, and there is currently no limit. These deals can be short dated or overstock. Check out all of the Amazon deals here! Get close-up confidence with Trident Layers Sugar Free gum, the easy way to freshen breath and help protect against tooth decay. Trident Layers makes gum fun by swirling mouthwatering Grape Lemonade flavors together, creating a unique gum chewing experience that deeply satisfies any set of taste buds. With 50% fewer calories than sugared gum, Trident Layers has long lasting flavor, fights plaque, and restores your mouth’s pH balance to maintain a healthy smile. This order includes 12 14-stick packs of Grape Lemonade Trident Layers Sugar Free Gum. Get close-up confidence with Trident Layers Sugar Free gum, the easy way to freshen breath and help protect against tooth decay. Trident Layers makes gum fun by swirling mouthwatering Grape Lemonade flavors together, creating a unique gum chewing experience that deeply satisfies any set of taste buds. With 50% fewer calories than sugared gum, Trident Layers has long lasting flavor, fights plaque, and restores your mouth’s pH balance to maintain a healthy smile. Four out of five dentists recommend chewing Trident after eating and drinking to clean and protect teeth. This order includes 12 14-stick packs of Grape Lemonade Trident Layers Sugar Free Gum. 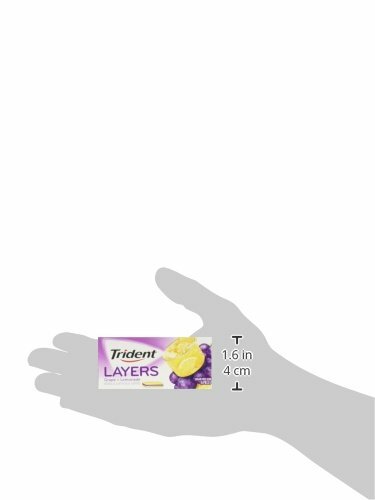 Buy the Trident Layers Sugar Free Gum (Grape Lemonade, 14-Piece, 12-Pack) from Amazon. Next articleLEGO Star Wars Boys’ Pajama Set – Low Price Alert!